Guwahati, Jun 23 : The Assam government in far-east India has rejected a revised proposal by the Centre for relaxation of visa norms giving free entry to Bangladeshi citizens below 10 years and above 70 years into India. The earlier proposal sent to the state was whether visa-free entry should be given to Bangladeshi nationals below 18 years and above 65 years of age. 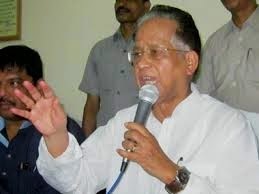 Chief Minister of the state Tarun Gogoi on Saturday told a press conference here that the state government had received a communication on June 19 from the Ministry of External Affairs seeking its opinion about the proposal and a second revised proposal was sent after the first one was turned down. “We have rejected this proposal and informed the Centre accordingly. We are opposed to visa-free entry to any national from Bangladesh irrespective of age,” Gogoi said. “This is not visa-on-arrival. We do not have any issue on that as we already have such facility with many countries. The UPA government had proposed visa-on-arrival with Bangladesh, but the latest proposal from the NDA government is for visa-free entry to a select group of Bangladeshi nationals,” Gogoi said. The Centre, he said, had sent the proposals, which were aimed at improving relations with Bangladesh as External Affairs Minister Sushma Swaraj would make a three-day visit to Bangladesh from June 25, during which she would meet its top leadership and was likely to discuss issues such as relaxing visa norms. “This is completely a U-turn from the poll promise. BJP had said something else during the campaign and is now doing completely the opposite after coming to the power,” he said. “People voted for BJP which promised to control price rise, reduce corruption and deport Bangladeshi infiltrators. But we have not got any hint of ‘Achche Din’ (good days) yet,” Gogoi said. On use of Hindi in states, the Chief Minister said it should not be imposed and anyone should be free to use the language that they were comfortable with.